APPLIQUÉ Fabric or trim sewn over a base fabric to give an appearance of an additional texture or application. BAMBOO A naturally antimicrobial and absorbent fibre made from bamboo, making it ideal for the warmer weather. Bamboo fabrics are typically very soft and a good choice for allergy sufferers. BED PACK Bed linen products packaged together from the same design story. This generally consists of a coordinating duvet cover, pillowcases and fitted sheet. A convenient way to to buy the whole look in one parcel. BEDWRAP™ Elastic garter made from faux suede fabric that fits snugly around and covers the base of a bed. It can be stretched over the top of the bed and put on the base without removing the mattress. Use instead of a traditional valance for a clean, contemporary finish. COMBED Better-quality fibres are combed after carding (a mechanical fibre-mixing process) for a smoother, finer woven cloth. COTTON A soft fibre that grows around the seeds of the cotton plant. This natural fibre is spun into thread used to make a soft, breathable fabric. COVERLET Made to cover a bed without covering the pillows. It is decorative, usually quilted and lightly padded. (Queen Size: 220cm x 240cm / King Size: 240cm x 260cm). Not as big as a bedspread – does not go to the floor. CROSS-STITCH A double stitch forming an ‘X’ in sewing and embroidery. DOBBY WEAVE A weaving technique resulting in small, repeated geometric patterns in the fabric. DUVET COVER A removable and washable decorative cover for duvet inners. EMBROIDERY The art or handicraft of decorating fabric with a needle and thread. ENZYME WASH Similar to a stone-washed effect, except that instead of using stones, the fabric is 'aged' and softened with an enzyme, which is less damaging and kinder to the fabric. EUROPEAN PILLOWCASE Larger than a standard pillowcase, it has a square shape and measures 65cm x 65cm. FLANNELETTE Cotton fabric that is brushed to raise the fibres resulting in a warm, cosy feel for winter sheeting. FLAT-PIPE Narrow fabric trim inserted into the seam of a duvet cover, pillowcase or cushion. Like cord piping, but without the cord inside. FLAX A soft, lustrous and flexible fibre obtained from the stalks of a blue-flowered, herbaceous plant. Also referred to as linen, flax is two to three times as strong as cotton despite its hair-like appearance (hence its description). FLOCKING Fabric printed with an adhesive resin where very short fibres are applied. This gives a velvet-like feel and surface. GROSGRAIN A ribbon made of closely-woven and narrow horizontal ribs. HAND-CRAFT Made by hand or a hand process (as opposed to a product that is made by a machine). Also see Hand-Made. HAND-MADE Made by hand or a hand process (as opposed to a product that is made by a machine). Also see Hand-Craft. IKAT A traditional style of weaving common in Indonesia, Japan and India. It uses a resist-dyeing process similar to tie-dye on either the warp or weft before threads are woven to create a pattern or design. JACQUARD A fabric with an intricately woven pattern. A special loom is used to weave the pattern into the fabric. LINEN A fabric woven with fibres from the flax plant. LUREX® A registered brand name for a yarn or thread made from a synthetic film with an aluminium, gold or silver metallic layer. 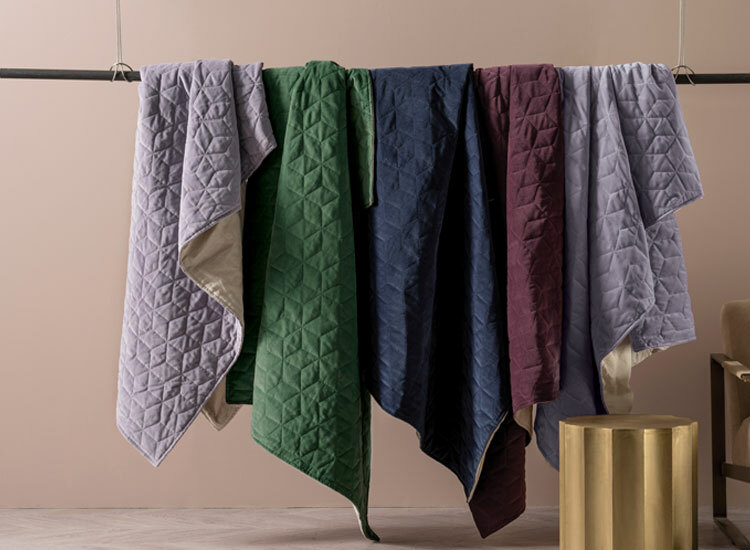 MICROFIBRE™ An extremely fine synthetic fibre accurately woven into textiles with the texture and drape of natural fibre, all with enhanced washability, breathability and water-repellency. MONOTONE An uninterrupted repetition of the same tone of colour. An example might be a series of stripes all in different tones of grey. PERCALE A closely woven plain weave in fabric. Percale sheeting has a crisp, cool feel. PILLOWCASE SHAM A decorative and often quilted covering for a pillow that may coordinate with a coverlet or duvet cover. PINSTRIPE A pattern of super-thin, parallel stripes used on fabric. PINTUCK A narrow pleat sewn in place by hand or a sewing machine. PLEAT A fold in cloth made by doubling the material upon itself then pressing or stitching it into place. POLYESTER A man-made synthetic polymer fibre. QUILTING A process of stitching through layers of fabric and filling it to create a padded design. SATEEN A type of weave resulting in a smooth and lustrous fabric with satin-like appearance and softness. SCREEN-PRINT A method of creating an image on fabric by pressing ink through a screen with areas blocked off. SEERSUCKER A lightweight fabric with a thin, puckered surface. Usually cotton and commonly striped or chequered. SELF-PIPE A piping trim made from the same fabric as the rest of the item in a design. SEQUIN An adornment consisting of a small piece of shiny plastic or metal used to decorate fabrics. SILK A fine fabric with an excellent lustre produced with fibres made by silkworms. The fibres from the silkworm cocoons are woven to make silk fabric. STANDARD PILLOWCASE Fits a standard rectangular pillow and measures at 48cm x 73cm. STONE-WASH A process using large stones to roughen newly-manufactured textiles, achieving a worn-in appearance as well as increased fabric softness. TAILORED PILLOWCASE Fits a standard pillow but has an extra width of fabric to give a tailored or ‘hotel’ look. This edge can be 4, 5 or 6 centimetres. The result is a stylish, floating effect at the edge of the pillowcase. THREAD COUNT A total number of horizontal and vertical threads in 10 square centimeters of woven fabric. TIE-DYED Fabric is tied, either with string or rubber bands, then dyed, either by submerging it or by squirting dye solution onto it. Where the fabric is tied, some areas do not absorb dye, thus forming (typically) circular patterns. VELVET A soft-tufted cotton where the cut threads are evenly distributed, giving it a smooth, dense pile and a plain underside. VOILE A lightweight fabric that is semi-transparent. It is often made from 100% cotton though it may be made from rayon or silk. WAFFLE A weave generally made in cotton with a layered construction for the purpose of making it ultra-absorbent and fast-drying. Usually used for towels but also for bed linen. Has the appearance of a culinary waffle hence its name. WARP AND WEFT A warp is the set of lengthwise yarns held in tension on a frame or loom. A weft is the yarn woven across the width of the fabric through the lengthwise warp yarn. YARN-DYED A process where yarn or thread is dyed after spinning. Threads are then woven into stripes, jacquards or check patterns.